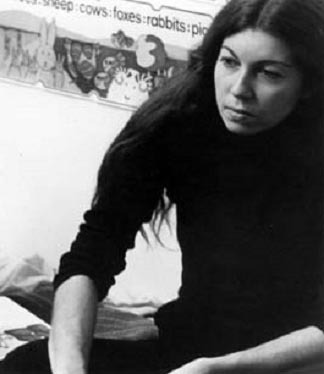 Born in Santiago, Chile in 1944, Marilú Mallet is a filmmaker and writer who came to Quebec as a political refugee after the coup d'état against President Salvador Allende in 1973. Unlike many refugees, she had grown up wealthy, lived in a large, beautiful home and had been a part of Chilean high society. Her father was the Minister of Education for Chile and a close friend of Salvador Allende. Through him she frequented the political elite of the country and even called Allende her uncle. Her mother, a painter, initiated Marilú to the arts at an early age. The immigrant experience has been central to Mallet's other films including LES BORGES (1978), about a family that had immigrated to Montréal from Portugal in 1967;IL N'Y A PAS D'OUBLI (1975), which presents the lifestyle of a group of exiled Chileans living in Quebec; and CHÈRE AMÉRIQUE (1989), about two Montréal women - a young Quebec woman struggling with the conflicting desires to have children and to pursue a musical career and an older woman, Céleste, of Portuguese descent, who has sacrificed the love of her children to make her fortune in America. Mallet has also written two collections of novellas, "Les Compagnons de l'horloge-pointeuse" (1981) and "Miami Trip" (1986). The stories of the first book are centred in the cataclysmic events leading up to and after the overthrow of the Allende government. The stories of Miami Trip focus on the tension, misunderstandings and frustrations inherent in relationships. Mallet's recent projects include LA CUECA SOLA (2003), in which the filmmaker returns to Chile and tells the tragic yet uplifting stories of five women of different generations who suffered under Augusto Pinochet's dictatorship and emerged as heroes under democracy. Currently Mallet is working on a fictional film entitledAtacama. It is set in the Atacama Desert of Chile, a sparsely populated virtually rainless plateau, running from the Pacific Ocean to the Andes Mountains.